Raigor Stonehoof, the Earthshaker, is a melee strength hero with multiple built-in area-of-effect stuns. He is primarily a ganker and initiator, and is typically played from either the offlane (position 3) or as a utility/roaming support (position 4). With his signature skill Fissure, he is able to stun several targets from a fairly long range, helping set up for the rest of his teammates to follow up with their own abilities. Enchant Totem gives him a large boost in attack power for a single swing, which can be devastating to squishy heroes. His passive ability Aftershock adds extra damage and stun duration to his abilities, which gets applied in a small area around him. And finally, the legendary Echo Slam creates a massive seismic disturbance in a large area around him, dealing more damage the more enemies there are in its radius. Earthshaker is a pretty good starting point for new players, due to the relative simplicity of his kit and gameplan. He is there to set up kills and teamfights for his teammates, and generally be a nuisance by not letting the other team play the game. However, he has several weaknesses that need to be kept in mind. For one, the fact that his Fissure creates a line of impassable terrain is a serious double-edged sword, and misplacing it during a gank attempt can easily cause the plan to go awry. Careful placement is therefore essential, which can take quite a bit of practice to learn. Echo Slam is also pretty easy to whiff, even with its nature as an instant cast ability. 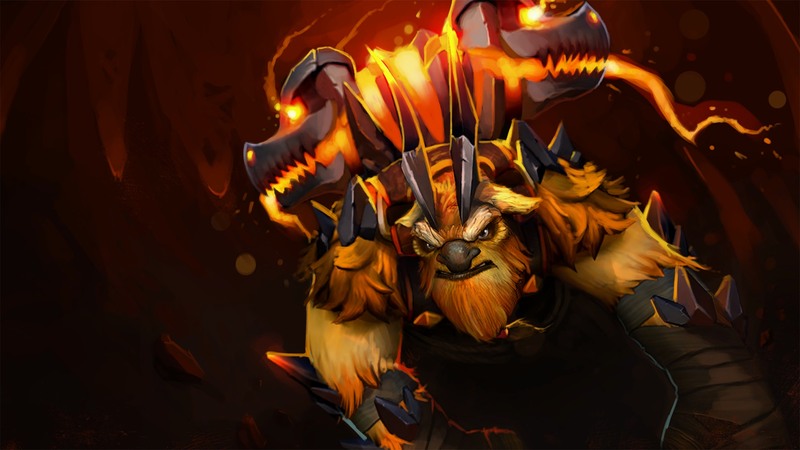 In spite of his obvious shortcomings, though, Earthshaker is still a very reliable hero in his designated role. His damage output is great, and his ability to keep multiple targets locked down is obvious. If your composition needs a high damage, long range stun, look no further than the one and only Earthshaker. Earthshaker’s skill progression depends on which role he is assigned to, but for the purpose of this guide we will assume playing as an offlaner or as a utility support hero. This is because the build between both roles are pretty much the same. The first order of business is to spend your Level 1 skill point on Fissure. Doing so will give you the ability to set up kills even before the creeps spawn, should your team wish to do so. It also allows you to block enemy heroes from Bounty Runes, and deter the same heroes from diving you or your teammates. All in all it’s just a fantastic choice for your first skill point, so try not to misclick any of the others. The second point should go to Enchant Totem, as it’s a really cheap damage buff in terms of mana cost. Last hitting becomes significantly easier with Enchant Totem, though as a melee hero Earthshaker needs to be cautious in the offlane. When playing support, though, Enchant Totem can be used as a harassment tool—provided that you don’t overdo it and dive straight into the enemy heroes’ hands. Because Earthshaker has a small mana pool, though, we recommend leaving his first two abilities at Level 1 each in the early game. Therefore, Aftershock should be maxed out first, as it improves your overall mana spending to damage ratio. Of course, making the most out of this involves sticking close to your lane opponents, which can be very dangerous depending on who you’re facing. Still, it’s a lot better than divesting yourself of all your early game mana. After that, Fissure should be maxed next in order to maximize its damage output and stun duration as soon as possible. The ability fuels Earthshaker’s effectiveness in the mid game, which makes it the best choice as the second priority. Enchant Totem should be last, of course, due to its multiplicative scaling. Finally, Echo Slam should be taken at every opportunity, as its damage output is just too good to pass up. Let’s just get this right out of the way: Blink Dagger is strongly associated with Earthshaker for a reason. It is the item to purchase, as it allows Earthshaker to gank unsuspecting targets before they even have time to react. Its mobility is absolutely invaluable, and it should be the first core item on your list. It is, however, very difficult to get there in the first place. 2350 gold is nothing to sneeze at, especially for a hero who starts the laning phase slowly. He doesn’t have an efficient farming tool, and must rely on staying alive as long as possible in order to get to his most coveted item. Therefore, it is important to get preliminary items that help you build towards the Blink Dagger. Arcane Boots, Soul Ring, and/or Tranquil Boots fall under this category, and we highly recommend getting them first. Opting for a naked Blink Dagger (which is to stay going straight for it without buying anything else beforehand) is not a good way to get it, unless your team is somehow dominating the early game hard. After Blink Dagger, we recommend additional utility items that make your team better overall. Things like Force Staff, Eul’s Scepter of Divinity, and Urn of Shadows are great choices in this regard. Force Staff also gives you an additional escape mechanism which cannot be disabled by incoming damage. Luxury items will be hard to come by as Earthshaker, though there are solid choice out there for him. Shiva’s Guard is one, since it gives you extra mana and an additional area of effect damage ability. It also hampers the effectiveness of right click hard carries thanks to its anti-attack speed aura. Messing with Earthshaker’s long cast animations (outside of Echo Slam) or preventing him from casting spells altogether is often the best way to counter him. Heroes such as Clockwerk, Silencer, Disruptor, and Skywrath Mage all excel in this department. Picks that can disable his Blink Dagger prior to a teamfight or gank attempt are also great counter picks. Zeus comes to mind first and foremost, thanks to Thundergod’s Wrath being a global damage ability that prevents Earthshaker from blinking. Spectre falls under this classification as well, and so do Viper and Venomancer with their respective damage over time abilities. Black King Bar hard counters everything that Earthshaker can do, so make sure to get it if he is giving you a lot of trouble. He can, however, play around it by faking his abilities and/or having his teammates force BKB activations, so you will need to be careful about when you use it.